I’m over a month into my PhD program and I’m still oscillating between wild, ecstatic optimism and stone cold, stop you in your tracks fear of the route ahead. Completing a Master’s degree was two and a half years of hard work and setbacks culminating in one of the proudest, happiest moments of my life – successful defending of my thesis. I’m back on track for five more years of the grad student life, but these will be harder, faster, stronger times ahead than before. Good thing I’ve got my Daft Punk pandora station ready to go. My Masters program didn’t entail any qualifying or comprehensive exams so they seem like lofty, impassable goals now. A sentiment shared by my cohort members, but we’ve found that the more information we have the more confidence we gain. We here at STS would like to share what we know about our own roads to knowledge with you the readers so that you guys can find the confidence to face this journey too. Not freaking out. I am not freaking out. I’m not. First things first, what exactly is the difference between quals, comps, and a thesis defense? Well, if you’re in grad school you at least know enough to be shaking in your boots at the prospect of any one of them. As you progress through your PhD program the powers that be (general your advisors) will want to ensure that you’re advancing at the desired pace, thus a few intense, intimidating milestones are thrown at you. The first of these, the Qualifying exam, serves to assess whether the student is capable of conducting doctoral research/scholarship. Quals often also serves as the PhD candidacy examination. Qualification exams are taken early in your program and are often based on required coursework. Once you pass your quals (and sometimes it takes a few tries, don’t worry!) feel free to relax a tiny bit and allow yourself to celebrate! Throw a wild soiree with your cohort! The PhD Comprehensive exam is given by members of your committee once a student has completed the required coursework (generally year 2 or 3, but ultimately depends on your program) and serves to evaluate mastery of the major studied. Sometimes presenting your research proposal can be wrapped up within Comps, as a way so show you have mastered the content necessary to proceed. If you’ve passed your Comps go ahead and celebrate once more! Now all you have left is research, thesis writing, and a thesis defense! It’ll be tough, but you’re in the home stretch. A lot of students are terrified by the time they are fast approaching their thesis defense. A lot rides on that final presentation of research and oral examination by the committee, but honestly once your committee signs off on a date for you to present and defend you’re practically finished already! They don’t want to set you up to fail (it reflects poorly on them as well)! Smooth sailings on through to your doctorate! Congrats once more! You’re a doctor!! If you picked up on how it sounds like your committee has a lot of power of your progress through your PhD project, then you’re not far from the truth! However, they will also be there to provide you with all of the guidance and insights that you could possibly need. After all, they’ve been in your shoes before and have helped others through your journey. The majority of your committee will be comprised of professors from your department, but if you’re one of those brave souls that goes for a more interdisciplinary approach you’ll likely find members from other departments or even other institutions. You are in charge of approaching and inviting generally four professors to serve on your committee. Something to keep in mind while forming your own band of professors is that you’ll want to ensure that you choose members that will have the time and resources to help you with your thesis research, writing, and defending. You’ll need to have a close working relationship with these people so don’t be afraid to choose based on how well you foresee getting along with them. A highfalutin big wig in your field sounds great to have involved, but if they have no time for you then maybe it’s best to find someone else to serve instead. You want people who are passionate about being on your team and helping your grow and develop to ensure that upon completion of your PhD you’ll be ready to find a postdoc or a job in a variety of fields! Workin’ hard with the cohort. If you are, like me, at the very beginning of your program with all of these hurdles strewn in your future it can be incredibly intimidating. A lot of doubts can creep into your mind about your ability to gain a mastery of the content, especially if you’ve changed fields! I’ve had quite a few chats with my cohort already about our looming quals at the end of this year. Our department recently changed it’s program for PhD students and we’re the first group to go through this new design! We feel a lot like guinea pigs – the kind that people eat rather than keep for pets! I have dealt with this nervousness by finding out as MUCH as I can about how I am expected to progress through each year. But what has really quelled my quals fears has been talking to my academic advisor and hearing his reassurance that no, the department really isn’t trying to scare anyone off or try and weed us out. They earnestly do want each and every one of us to pass and will provide us with all the resources to do so! Rather, instead of being a weed out process, the qualification exam more serves as a way to ensure that WE are absolutely sure that we want to put in the work necessary to earn a PhD. I’m so grateful that I am part of a large, wonderfully supportive cohort that is already working hard to make sure no one falls behind. If I can recommend just one thing to new graduate students feeling that fear creep in, it’s to talk to your cohort, the grad students that are ahead of you, and professor in your department. The reassurance I’ve gotten from admitting my fears and insecurities to others and in turn hearing theirs has been a tremendous confidence booster! 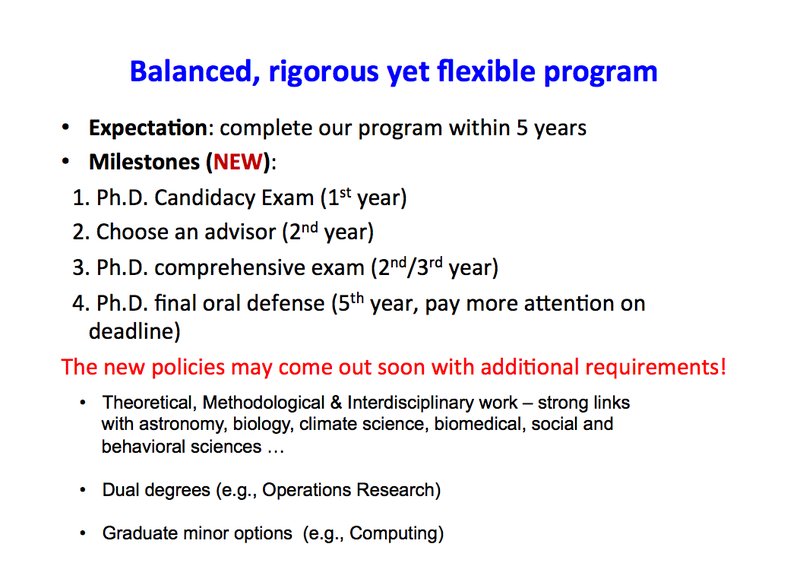 You can check out my (Meridith’s) Statistics PhD program expectations in the slide included! If you are interested in hearing about Rachel’s Ecology program (she’s in her 3rd year and has just schedule her comps!) you’ll want to keep an eye on our Sweet Tea, Science Tumblr this week! If you are also working on getting your PhD (or Masters!) we’d love to hear how these major exams work in your field/department! There’s so much variety that we can’t hope to cover how these things work for everyone, but go ahead and let your experiences be known down in the comments. Ten Tips for Tackling that Thesis! Meridith and Rachel are both in PhD programs, which means dissertation writing will be in their future. While dissertating will come with its own sets of challenges, they have both managed to survive the process of completing a Masters thesis! Here are the top ten tips and tricks (in no particular order) they used to keep sane, be productive, and come out the other side. 1. If you haven’t been productive in 15 minutes, then it’s time to change locations. R: First I got work aversion to my desk, then I got work aversion in the stats lab (luckily, after I was done with stats). I finished writing by visiting (almost) every coffee shop in Long Beach for a few days in a row before I had to move on to my next location. M: Can someone figure out how to fix the mutual exclusivity of working outside on a sunny day and being able to see your computer screen? 2. Lists are your friend. Make yourself a timeline. Two of Meridith’s three amazing Thesis Besties! 3. Find a thesis buddy that will sympathize with all of your complaints, bemoans, trials, and tribulations, but will still help you stay on track. Make sure you pay this forward! Having coffee dates with your thesis pal where you talk about what you’ve done and plan to do will help you actually do those things. Having to look another human being in the face and admit “I didn’t do any of that.” is not fun. Bonus point if this person has a dog. 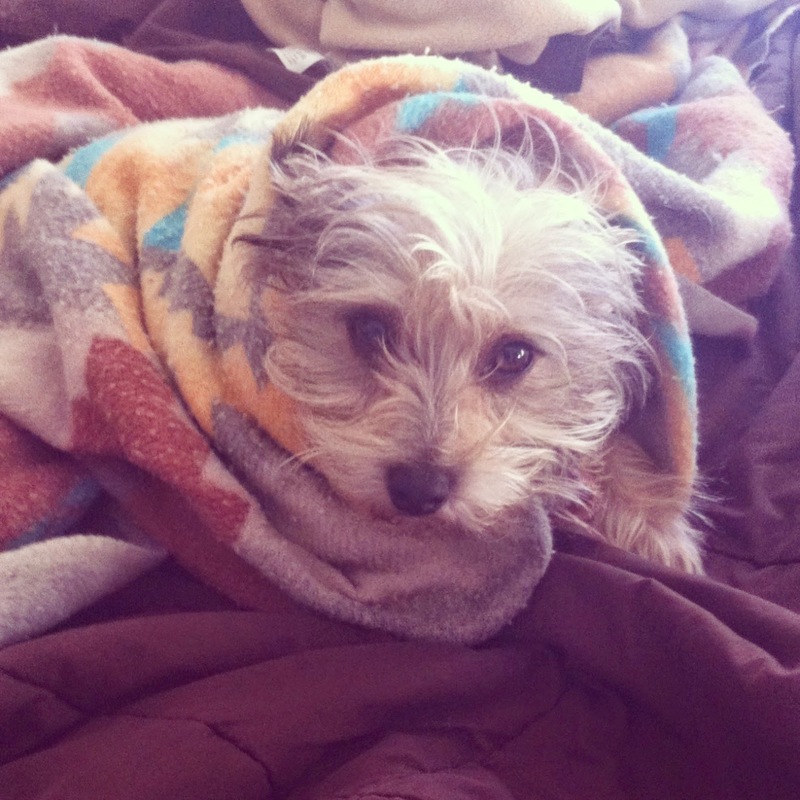 Dogs make thesis writing way better. 4. Pick some upbeat tunes. ﻿﻿﻿﻿M: This is my solution to many, many things. R: I wanted to give Pandora an acknowledgement on my thesis. 5. Schedule at least a short block of time every day to write. Just write something every, single, day. 6. Make time to cook in big batches or get right in your head about eating frozen foods. It’s just going to happen. R: I tried to resist this for so long and ended up with a backlog of cabbage from my CSA box, because I had no time to cook. This culminated in my arrival at the lab at 7am on a Saturday with a large mason jar full of cabbage juice…because that seemed like a good decision at the time. That night I bought a huge container of frozen burritos, and it was pretty much the best decision I made that month. M: I went through a phase where my working location was in the student center…really close to the on-campus Taco Bell. I’m not proud, but I love bean burritos. 7. Communicate with your advisor. We would highly advise having a recurring meeting time each week. This is like having a thesis buddy x1000. These recurring meetings will insure you keep making consistent progress. They will also keep you from spending too much time in the tall grass. You’ll still have to redo your stats section 3 times, just get over that now. 8. Save. Save often. And save files all in multiple locations. This does not imply that you can save things all willy nilly. You should just have multiple backup copies. Make sure to save things with a meaningful name in a meaningful locations (ex: bad → on your desktop a file called “Thesis_ish”; good → Folder “Masters”, subfolder “Thesis Drafts”, file name “Thesis_full version_draft 3”). We would recommend you save to your hard drive, to the cloud, and do some sort of external device that you keep in a separate location. 9. Stay away from time-sucking websites. There are lots of applications you can add to your web browser, and you can set these to block you from accessing these sites to varying degrees. M: I had a few, but “Graduation or Death” was helpful. Post thesis defense! 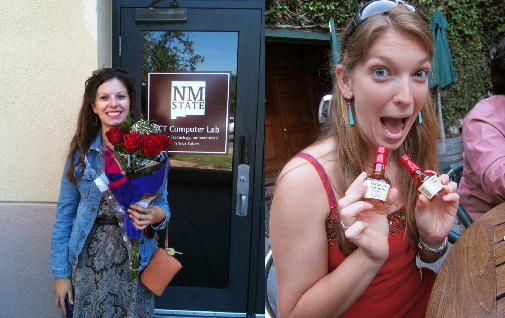 For the record, tiny bottles of liquor were purchased by a member of Rachel’s committee. Collaboration is a vital part of the scientific process. Do you think I’m going to save the world on my own? Nope. I’m going to need at least a little bit of help. The more great minds working on a project, the faster advancements may be made. And we need advancements (I’m look at you, self-driving car peoples)! Any sort of collaboration is difficult across distances. Technology has made the process easier and email is currently the main tool for communication for researchers. While I’m really proud of the older generations of scientists for getting on track with email, I’m afraid I’m going to have to ask them, and everyone, to utilize Google Drive for their collaboration needs. Being able to access my Google Drive from anywhere keeps me productive! 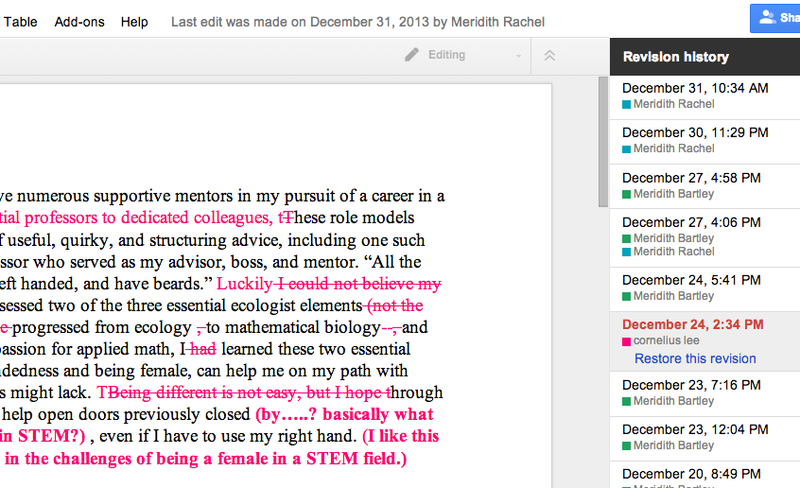 Google Drive was repeatedly been a useful resource throughout my graduate school years. I could share files and folders with my undergrads so they would always have access to protocols, data sheets, etc. It made for fast communication and kept my data safely stored in multiple locations. However, when I was working on writing manuscripts I would email it to all of my co-authors whenever they needed feedback and would inevitably have to shuffle their responses and changes back into a master copy. This updated copy I would then save as a new file. My third manuscript has yet to be submitted because my advisor and I accidentally worked on two different file versions, and now she has to incorporate her updates into my most recent version. I never wanted to use Google Drive to have people revise my papers because I couldn’t for the life of me find anywhere to turn on Track Changes. But when I was working on my PhD application essays and desperately wanted people’s feedback, I realized Google Drive always has track changes on! And it’ll keep track of who edits what, when, where, and why! Ok, not why. Unless they leave a comment! 2) Share it with your collaborators. – You can share via a provided link or email. You may also control the level of privacy your work has. 3) Write and edit the file! – All together now! 4) Keep an eye on the changes/comments made by others – Anytime you want to open your revision history, click “All changes saved in Drive” at the top of the page. So many revisions! So many colors! Writing that army of essays was undoubtedly one of my least favorite parts about the graduate school application process. I absolutely could not procrastinate them because I wanted to get as many discerning eyes on them as I possibly can. Now that all of my PhD applications are submitted I have the power of hindsight, which allows me to see just how much my essays benefited from the help of several friends’ advice. Some ended up being completely rewritten multiple times. Multiple people were able to review and revise the essays at the same time, and I never had to compare different file versions emailed to me. No going back for me now. Go ahead. Put those theses into GDocs. Your manuscripts. Your group work assignments. Unleash the power of automatic track changes and maximize collaboration! Never worry about hitting save again.